In a Vase on Monday: What’s in a Name? 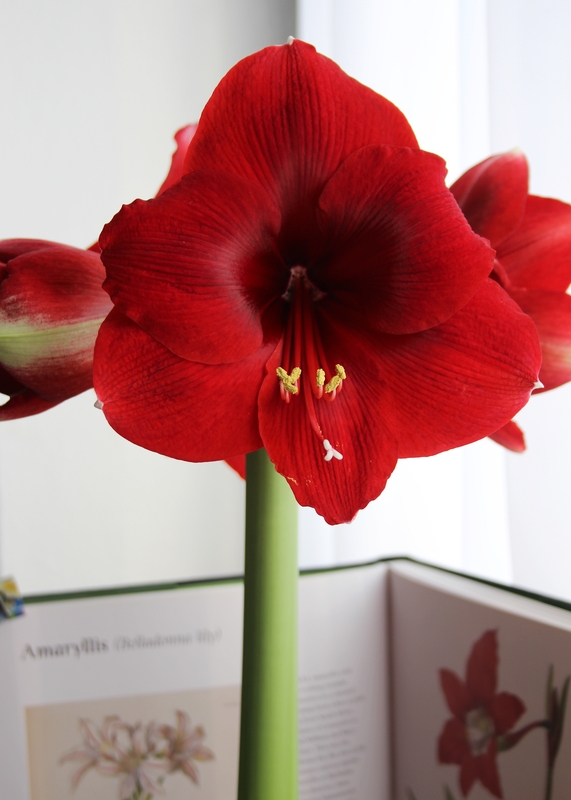 Yes, we all (well, most of us) call our Amaryllis by the wrong name. Strictly speaking the bulbs we in cooler climates grow indoors in winter are Hippeastrums; the South American lily. And not Amaryllis, which is the African belladonna lily. I consider myself an ‘ordinary plant lover’. How about you? Thank you to Cathy at Rambling in the Garden for hosting this lovely meme. Why not visit her to see what others are finding for their Monday vases/flower arrangements this week. This entry was posted in Bulbs, In a Vase on Monday, Traditions, Words and tagged Botany, Bulbs, Winter, Words. Bookmark the permalink. That´s interesting! I think important is, we understand what we mean. Still a bit snow here too. Minus 9, wow! The snow looks beautiful (from this distance, anyway). I love the strong red against the snow and you found the perfect pot. Yes, it is bitter cold still. Some plants are starting to really suffer as it has been frozen for so long now. The flower is anything but ordinary. Gorgeous. Stunning! I have to say I really like the new hybrids, like this one, with shorter stems. Beautiful. I especially like the way you have displayed it with the snow in the background. Oh yes, the shorter stem is a big improvement! And I knew the ‘rot’ referred to red, so googled the name – dark red? Thanks for sharing, along with your snowy background ps hurrah for ordinary gardeners! I am a bit worried about the Euonymus and Laurel – they both hate permafrost and the ground has been frozen almost continuously since the beginning of December. The Rhododendron has curled its leaves up tight against the cold! And the Gaura…. oh dear. Perhaps we will be lucky and there won’t be too many losses! It hasn’t been so bad here, you’ve all my sympathy. Gaura often self seed so maybe new ones will come up. It has become very mild of a sudden, the robins are chasing each other around the garden, I thought I felt a touch of spring in the air today! I’m with you, I’m an ordinary plant lover as well. 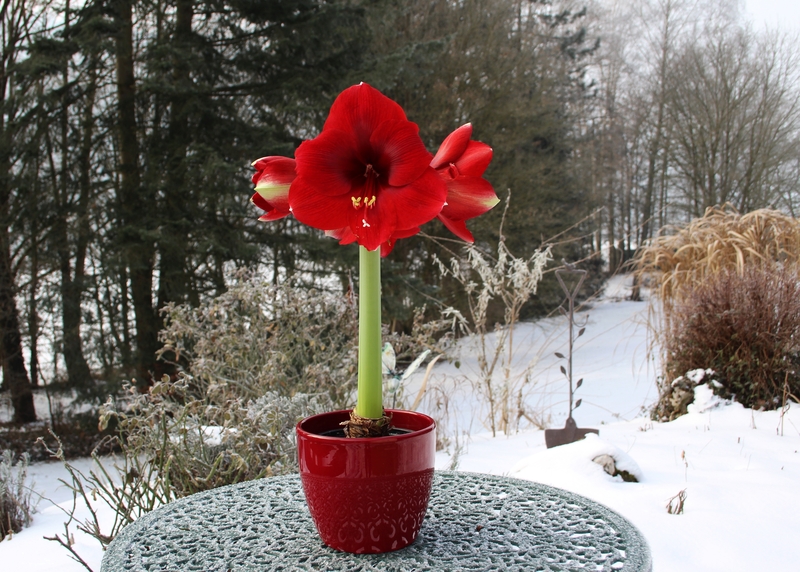 Love the photo of your Amaryllis with the background of snow. It shows why so many people enjoy its colorful bloom during the winter. Beautiful. I have two new types budding up. The anticipation keeps me checking them each day. Oh my goodness! The color is stunning! Count me as an “ordinary”, all these fancy names are not anything that holds my attention! Very quick! The cold is beginning to get to us… even the canal in our valley is freezing over. Glad I have some colour indoors to look at anyway! Dunklerot? actually that is quite a name. Ordinary plant lovers are usually extraordinary gardeners! Love the red/snow contrast. I think you and the ‘what’s is name’ plant are very brave venturing outside at -9c! 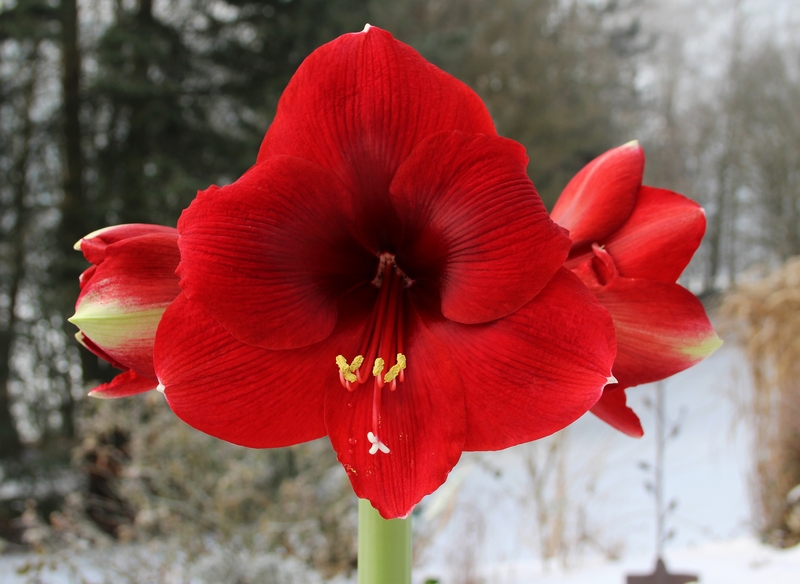 The red Amaryllis is quite stunning against its snowy surround, Cathy! My own Hippeastrums, planted in the (now sodden) ground, are probably months away from blooming but I enjoy seeing yours in the meantime. BTW, I love the ice crystals balanced on the delicate grass plume in your header too. [J+D] Very ordinary, both of us. We’re certainly no connoisseurs. We’ll never be able to plan and entire bed – and would never attempt to. For indoors, our window-cills get filled by chance. But at least there’s always something new to discover. Or re-discover! That’s why we follow Words and Herbs and other plant and gardening blogs. We like others’ enthusiasms, we like their ideas – for their own sake, and because they inspire us to try something new. We’ve never had an Ameryllis, but it appears that if we had it might not have suited our conditions: we might now look out for an Hippeastrum!! Oh this is stunning, it reminds me of Snow White, the dark red against the pure white snow. Lovely images. That must be quite a sight Amy – Amaryllis flowering in a desert situation. The colour of this one is quite stunning, while a white one I also have indoors pales in significance next to it! There are many things in a name!Thanks, Cathy! Oh no, I’ m a pedant when it comes to plant names. If plant lovers can’ t get them right then who can? But whatever you call it, your hippeastrum is lovely and so dramatic against the snow.And I like the way it blooms on a shorter stem than some. I suppose you are right, but speaking the same language as fellow gardeners is also important! 😉 The shorter stem really is an advantage on this one, as the flowers are very large. Look at that gorgeous red and velvet-like texture. It looks lovely against your frigid white landscape, Cathy. Oh, that would be fabulous! You would be the bell of the ball.